Another day in the recliner. Another day of haphazard meals. Another day of lesson plans left unchecked. Another day of excessive tv. Another day of constant mental struggle. 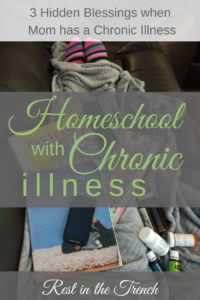 Do you ever wonder if homeschooling when Mom has a chronic illness is just too much? Do you doubt whether you can really do this? Maybe it would be better to put the kids back in public or private school. Maybe your dream of enjoying homeschooling is just beyond your reach. Maybe not. Perhaps the hidden blessings you might encounter will far surpass the blessings you expected when you started this homeschool journey. Perhaps your chronic illness is actually a tool to help your homeschool thrive. You know that God causes all things to work together for good to those who love Him, to those who are called according to His purpose. Yet you wonder if chronic illness is exempt from the list of all things. How can this really work for good? But God never releases me from my call to homeschool. I am (ever so slowly) learning to see the good He is working on our behalf. These hidden blessings are convincing me that He is able even when I am not. Lines have blurred between school and the rest of life. We often have no choice but to have an unstructured day. Not my personal preference. But learning continues. When people ask what our school schedule looks like, I struggle to find an answer. Learning and life occur simultaneously. These blurry lines are cultivating a sense of lifelong learning outside the “school” lines. I allow myself permission to leave tasks undone. I love checklists. But my body frequently holds me back from accomplishing the tasks I plan. But you know what? My children continue to learn anyway. Sometimes they even learn better when I must step back. Over time, I realize not every task must really be accomplished. We depend more on our extended homeschool community. We haven’t chosen to homeschool in an attempt to isolate ourselves. Our family is dependent on the body of Christ for our children to flourish in their learning. My children do not need to learn everything from me. Actually, as they get older, they need other mentors more than ever. My illness just gives us a jump start in gratefulness for the help we are given with academics, character, and practical life. God’s curriculum is better than my plan. Curriculum is the course we set for our family’s journey of learning. I love making plans for our course for the year. But we’re ten years into homeschooling, and I have yet to finish one year’s plan exactly like I expected. We do accomplish plenty of academics. But I’m learning that God is using even my illness as part of His curriculum for the learning He wants my children to receive. Their hearts grow in empathy for others. If you see me in public, you might never guess my health struggles. But my children know the story behind my outer story. They help with dinner when my energy is depleted from grocery shopping. They pray daily for my healing. They serve me with food, blankets, and space. In all this, their hearts are learning to love and serve others also. Independent learning looks different than I anticipated. Several years ago, I spent most of my time on the couch. Thankfully, we had no babies or toddlers in that season. But everyone was still under 10. They learned to cook, clean, etc out of necessity. They learned to continue habits, at least periodically, I had taught them. I began to see the beauty in their creativity when bored when I just don’t have energy to take them to activities. With more than I can handle, my trust in God is greater. I must be dependent on God Almighty to lead my children in His way. Yes, we’re really dependent on Him all the time anyway. But living with chronic health problems emphasizes reality. I am consistently inconsistent. If I were healthy, I just might manage to be consistent enough to trust in myself. God does not require my performance to accomplish His purpose. Will my child miss out on his calling if I don’t perfectly complete the curriculum? Will they never learn how to read if I don’t teach phonics every single day? Will God never reach my child’s heart if I don’t teach a Bible lesson every morning? He is able. Even when I feel as if I have failed. I’m seeing His fruit already, and that fuels my faith that He will accomplish His purpose in my children. My heart grows more restful. Without chronic illness, I might never have slowed down enough to learn to trust. If I were always physically strong, I would consistently err on the side of striving. Striving does not promote rest. Rest does not come from an absence of activity either. But being forced to stop, completely stop many days, has taught me to seek a place of balance. I’m still growing in my restful heart, but I have been blessed with rest. In that moment, you can make a choice. Choose to search for your hidden blessings. Have you seen these blessings in your family’s homeschool? If you haven’t yet, are you willing to hang on and trust that God is able? Are you willing to search for how God is working His good even through your illness? Rest in your opportunity to gain a fresh perspective on education, watch as your children receive unexpected lessons, and grow deeper in your faith as you gain a more restful heart. Look for the unseen gifts and trust God will work even in chronic illness for His good in your family.